Feedly is a feed reader which is an application that brings all the new information you are interested in into one place. It makes it easier for you to track everything that is happening. It makes it easier for you to sense what is going on. As and educator Feedly would serve as a great time saver as everything is in the one place, no need to continually be logging in and out of many different accounts to keep track of new information. Blogging helps me as an educator to reflect on my pedagogy and continually improve my skills, management and organisation. Blogging also helps to enhance the quality of your learning by following and connecting with other people. Kelly links to Kathleen Morris’s blog post on The Benefits of Educational Blogging which goes into much more detail describing the benefits on this page. Her blog is a great example of how this wonderful ICT can be used in the classroom and you can view it by following this link. Twitter is a valuable and powerful networking tool that helps develop a different sort of connection between members of my Personal Learning Network (PLN) and a way to learn and network with others. Twitter helps me as an educator to keep up with new learning and be plugged in to an ongoing source of professional discourse and resource sharing. It helps me to stay professionally current and able to tap this stream of information any time I like. It is a relevant, timely, ongoing, interactive, daily and personal way to use professional development but is flexible enough that I can make choices about who is part of my network to create relevance for myself. A group of first graders in Ohio, USA have transformed Twitter and other social media platforms into their very own global classroom connecting with hundreds of students and teachers from 42 countries around the world. “We’re learning to collaborate so we can get bigger ideas! We noticed that when we listen to others our thinking changes and grows.” (@Frazier1st)- http://www.scribd.com/doc/139474790…. Some of their Global Classroom Projects include Flat friends/mascot exchanges (F-3), Edmondo Penpals (2-3), Mystery skype (K-3), The Global Lunch Table, The Sunny Thought Project, Kids Speak 2012-13, Save The Rhinos Project and Special Events Newspaper. For more details on these projects click on this link or to follow them on Twitter: #globalclassroom. I must admit this week was quite full on as I engaged with all of the available material on the study desk and signed up and set up a lot of new ICT accounts. 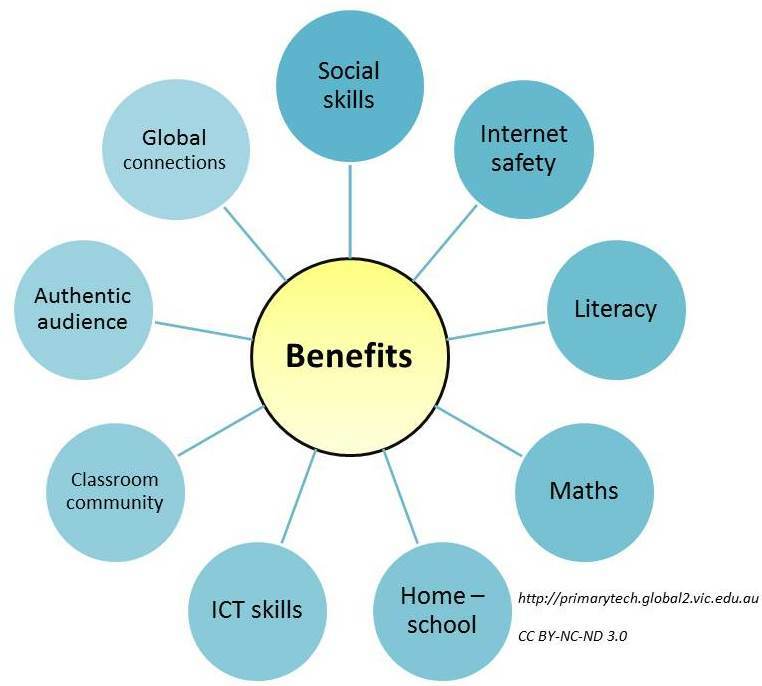 As I have mentioned before in my introduction I am very interested in using ICTs in teaching. In order to be able to competently and confidently use ICTs with my students I really need to discover all the resources available to me. Prior to this course, I stupidly thought I was fairly well plugged into it all. I never thought I was a professional or anything but I felt I had a good knowledge of how to use many different types and the ones I didn’t, I felt I knew enough to get by. Then I discovered some of which I have never heard of before. The huge amount of hours I have put in already aside, I have really enjoyed this week, learning new platforms and better understanding some of the ones I have used previously has been so informative and fascinating. The article “Tiny bursts of learning’ http://chrisbetcher.com/2011/04/1483/ has really opened my eyes to how beneficial social media can really be to not only us who will become teachers but to us as life-long learners. The article states the enormous value of belonging to a Personal Learning Network was being touted, and Twitter is nearly always being suggested as the ideal tool for building that network. Having this article presented to me at the beginning of this semester while learning in EDC3100 has really fuelled my interest and taken it to that next level. I am ready to learn and get as much out of this subject as I possibly can! I know I need to be patient as this semester hasn’t even started yet but I am feeling disappointed that I only have four followers on my Twitter account. I am really trying to set up my PLN. I have contacted all of my teaching and pre-service teacher friends to see if any of them have accounts and I was so surprised to discover that not many at all have. If you would like to follow me on Twitter my account is @teaganchilds and I would LOVE to follow you in return. It has been really interesting so far to view other EDC3100 students’ blogs. I have enjoyed having a snippet of insight into their perspectives of education, ICTs and their specific sectors. It has been great to talk to you all and see different ways of looking at things. I really am excited to learn more from and work with you all throughout this semester and hopefully beyond.